What are the Most Popular Document Binding Options? 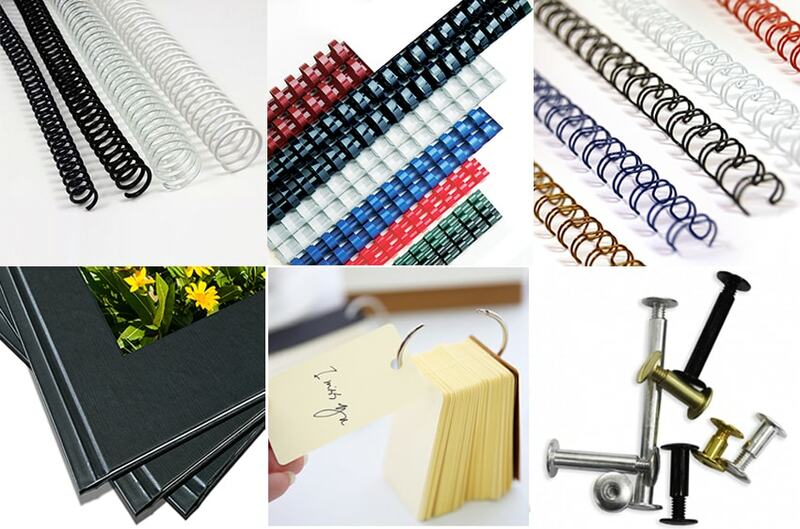 Some of the most popular document binding options include spiral binding (plastic coil), GBC comb binding, twin loop wire binding, thermal binding, loose leaf binder rings, and Chicago screw posts. Each of these binding styles has its own pros and cons, and each can help make your documents look professional. The perfect way to impress potential and current clients, these document binding solutions are easy to use, and can help you make a great impression. • Spiral Coil Binding: Plastic coil binding, sometimes called colored coil or spiral binding, is a great way to bind presentations and books of many kinds. They are flexible and fun, and come in a huge variety of colors. The continuous coiled binding spine gets rolled into punched holes on your book. You will need a coil binding machine to use plastic binding coils. • Wire Binding: Twin loop wire binding comes in either Wire-O or Spiral-O hole spacing. Wire bindings are one of the most popular options because they look incredibly professional. They are shaped in a "C" and are then closed around your punched pages to create a perfect bound document. The Wire-O bindings use a wire binding machine, while the Spiral-O uses a plastic comb punch paired with a wire closer. • Plastic Comb: Plastic bindings, also called GBC combs, are easy and allow for quick editing, as needed. They are very popular for schools, as well as print shops and groups that make cook books. These plastic bindings are opened with the help of a comb spreader so you can place your rectangular-hole punched pages onto the spikes, and then closed when you release the spreader. There is no limit to the number of times you can edit plastic comb bindings. • Thermal Binding: This is, by far, the easiest and fastest way to bind pages together. They use a thermal binding cover that wraps around all of your pages, and has a pre-applied glue in the spine. Depending on the thermal binding machine you are using, you can make multiple books per second. All you have to do is place your pages into the cover, and place the cover onto the machine. Then move it to a cooling station, and you're done. There are a lot of different thermal binding cover options as well, so there is versatility with what kind of documents you can bind. • Binding Rings: Loose leaf binder rings don't need a machine; just a standard hole punch. Their loose leaf functionality means you can use just 1, or as many as you want on a document, so can be incredibly affordable as well. Easy to edit, just open and close the rings as many times as you need. They come in several sizes, and even plastic book ring or metal binder ring options. • Chicago Screws: Just like binding rings, all you need is a hole punch to use Chicago screws. Also called binding posts or screw posts, they come in a ton of different sizes, and even have extension pieces that you can add in -- so there really is no limit to how thick a document you can bind. Binding posts are also easy! Just screw them together through punched holes, and that's it! Edit them as many times as you need. • Ring Binders: Standard binders are, as you know, very popular! There is no hassling with machines or supplies; just grab yourself a 3-hole punch and start organizing paperwork and binding documents with ring binders. We have poly plastic options, as well as clearview binders. What are the Best Electric Spiral Binding Machines? Here are the 4 Top Picks!